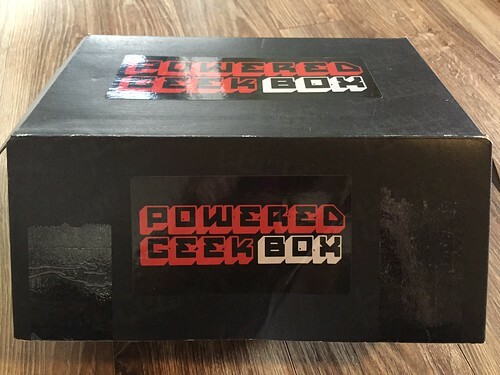 Powered Geek Box (formerly Power Up Box) is a geek subscription box featuring epic gifts for nerds, geeks and gamers. 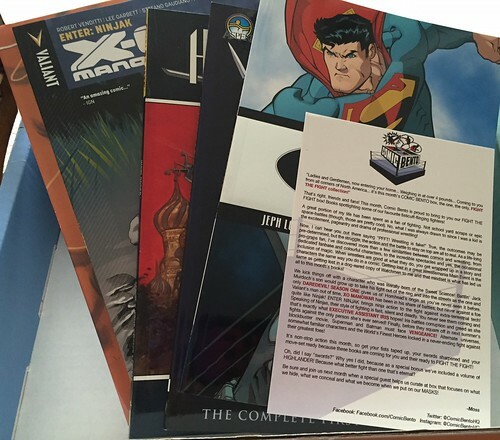 Our subscription box service delivers great gear and novelty items from big names like DC Comics, Marvel, Nintendo, Star Wars and Capcom right to your doorstep every month. 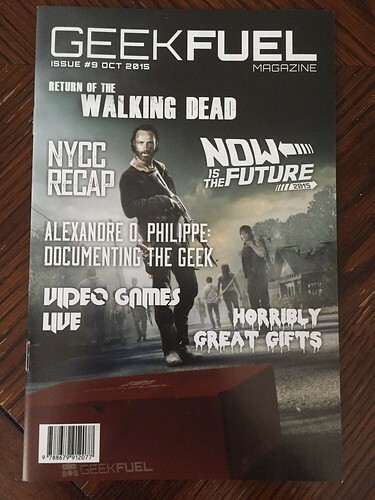 Treat yourself to our geek subscribe box service or send it as a gift. Powered Geek Box has two subscription box options: Deluxe (4-6 items) for $19.95 plus s/h per month or Premium (6-9 items) for $29.95 plus s/h per month. Plans are cheaper if you buy more than one month at a time. This box was sent to SciFiChick.com for review. The October box that was sent to me for review purposes was the Deluxe box. 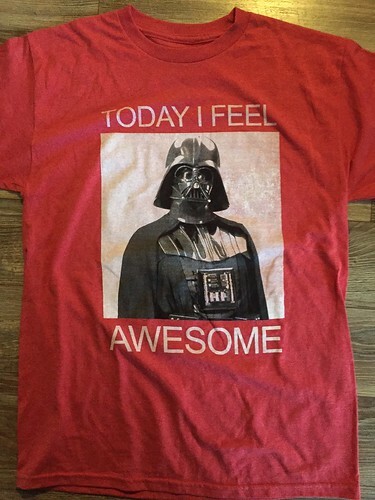 Today I Feel Awesome (Darth Vader) Tshirt (Retail $12.99) – Pretty much the best shirt ever?! I had to show this off around the office. 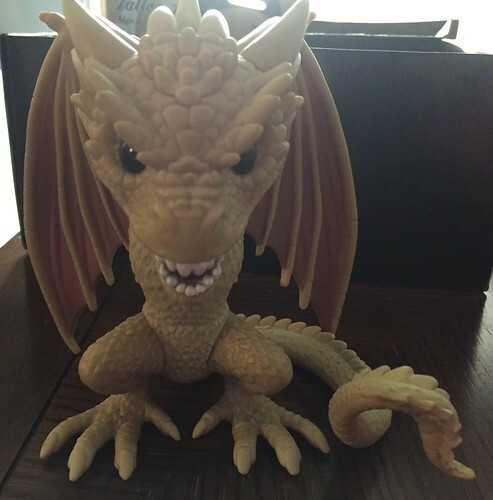 Game of Thrones Dragon Figure (Retail $14 on up – in a box) – This figure was a bit of a strange addition as there was no box and no label. I won’t be able to re-gift this other than to my nieces and nephew who like playing with dragon figurines. It looks like the Funko POP Viserion 6″ figure. Hopefully, paying subscribers got their dragon in a box, for those who collect them. I’m guessing the reason is that the Funko box wouldn’t fit in the standard Powered Geek Box. Which is a shame. The value plummets without it. 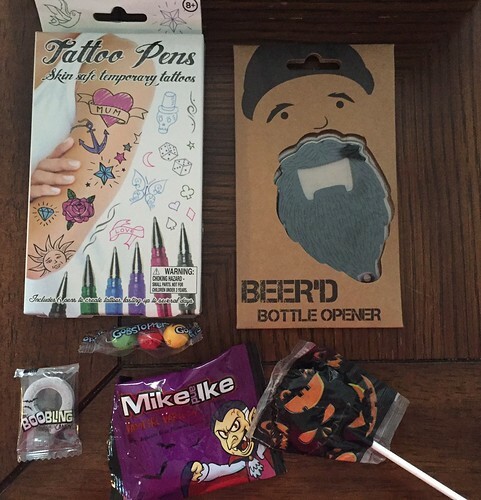 Tattoo Pens (Retail $25 on Amazon, less than $10 on Ebay and other sites) – These will be a hit with my nieces. They love drawing and temporary tattoos. Beer’d Bottle Opener (Retail $6.95) – This is another unique, novelty. While it’s not exactly geek, it is pop culture and would make a fun gift. And some Halloween candy filler is always appreciated. 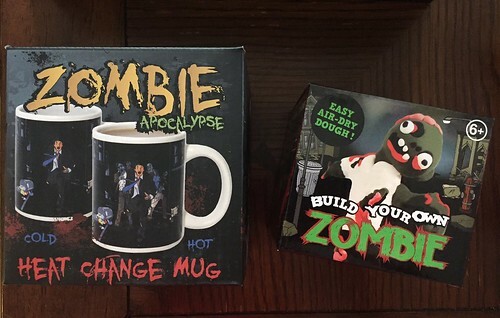 Zombie Apocalypse Heat Change Mug (Retail $10.34) – Zombies appear with heated liquid. This is another fun novelty item that is very appropriate for Halloween – and zombie fans. 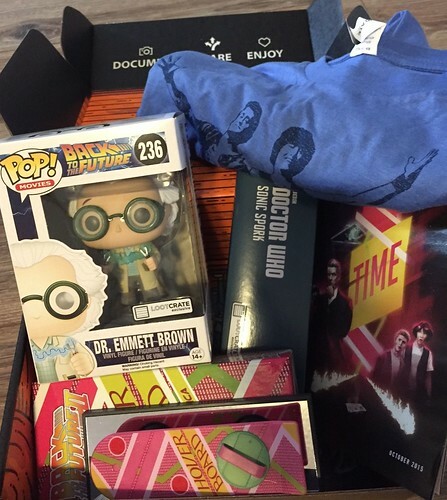 Summary: This may be the best box yet with the fantastic shirt and the overall value. My only complaint is the lack of box for the Funko POP. 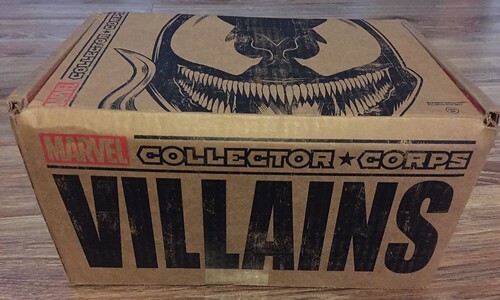 This is the 4th box from Collector Corps with the theme Villains. 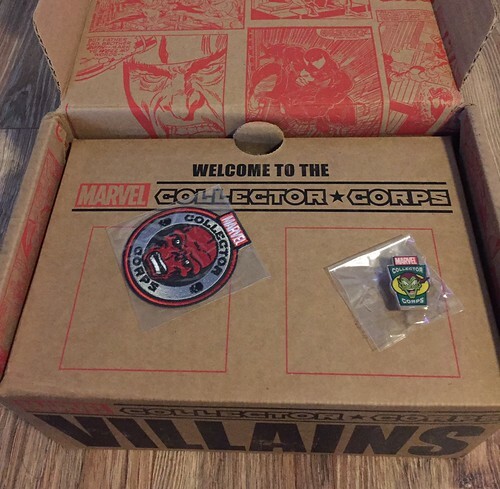 The Marvel Collector Corps offers these boxes starting at $25 plus s/h. Each box comes with an exclusive badge and pin. Red Skull and Green Goblin, so we’re off to a good start. 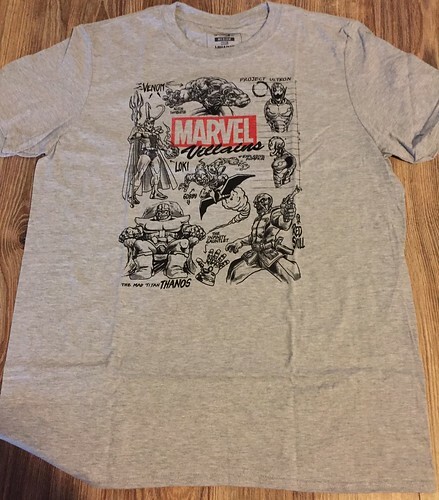 Marvel Villains Tshirt (Retail $10?) – I was pleasantly surprised with this shirt. It’s full of well-known villains, in a fun, design, and on a gray shirt. Anytime I get a shirt other than black, I’m happy. And this is a nice, soft shirt that feels better quality than past boxes. 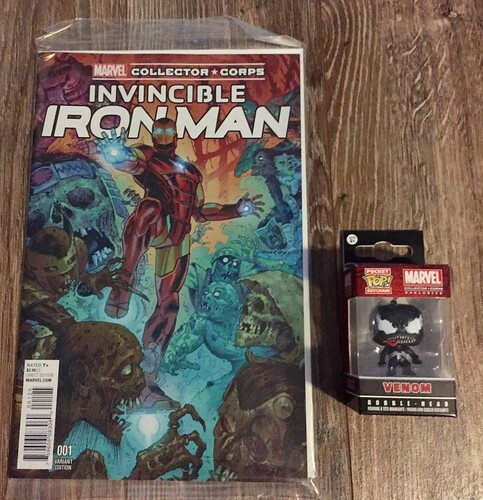 Invincible Iron Man #1 Marvel Collector Corps Variant (Retail $3.99+) – Another awesome variant that I’ll definitely be keeping. Venom Funko POP! Keychain (Retail $9.45) – Here’s the first thing that I probably won’t keep. While I like Venom as a villain (and sometimes hero), I don’t need I’m not one to collect ugly villain characters. My collection is getting quite large already. 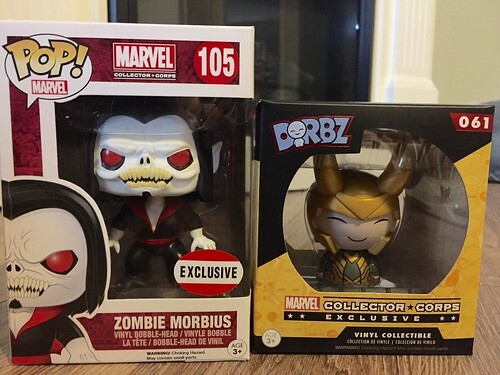 Exclusive Zombie Morbius Funko POP! (Retail $24.99+) – While I collect Funko POPs, I doubt I’ll display this one either. This was my biggest disappointment – the choice of POP this month. Exclusive Loki Dorbz (Retail $15.00) – I really was hoping for a Loki POP, as I actually don’t own one yet. But a Dorbz is better than nothing. I only have a few of these. 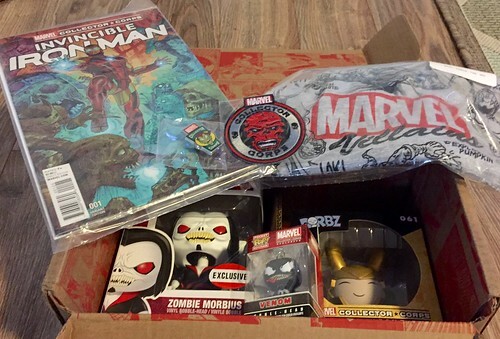 Summary: As someone who was leery about this box, due to the Villains theme – I was pleasantly surprised with the shirt and Loki. At least the value is still here if I sell the POP and keychain. I’m still glad I didn’t skip this month. The next Marvel Collector Corps box theme will be Guardians of the Galaxy. To say I’m completely giddy with excited would be an understatement. 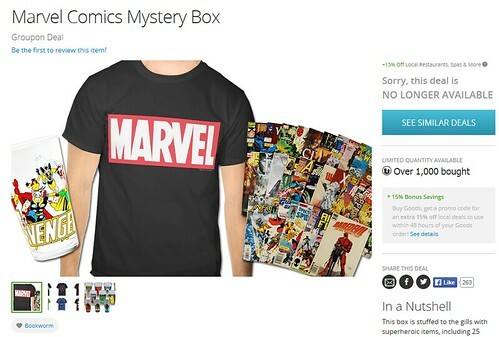 For quite a while, Groupon has offered a Marvel Comics Mystery Box with a guaranteed shirt, tumbler, and 25 comics for $39. I waited until it decreased or found a coupon, and snagged it for $10 off. Since there were no reviews on the site, I didn’t want to pay full price. I have since posted a review, though it’s still pending as of the time I write this. 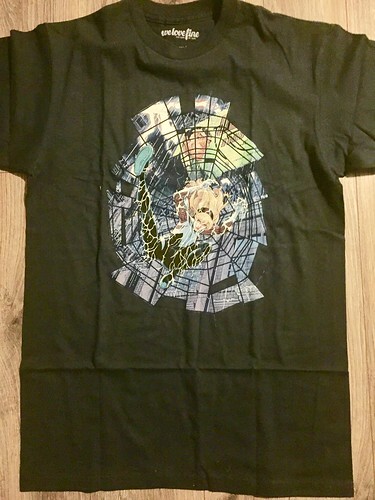 The Shirt: Spider-Gwen – (Retail $10?) Sorry, this is a terrible photo. The color is actually a really nice midnight blue, not black. I’ll actually wear this. I especially appreciated that it was a female superhero. There weren’t women’s sizes, only men’s, just FYI. 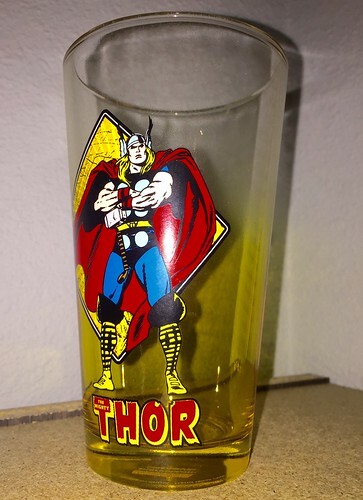 The Glass Tumbler: Thor – (Retail $10) – I love Thor, so I’m definitely keeping this too. 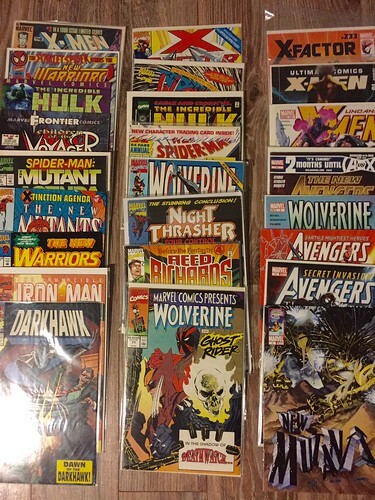 The Comics: Wow, this was a great selection! There is a great variety here from various years. There are even a few I’ve never heard of, which is nice. I can’t wait to dig into these. Summary: At $20 for the shirt and glass, and $10 for the comics – this was a great deal. I wouldn’t spend more than $30, just because you don’t know what comics you’ll get. If I can find another decent coupon, or if the price drops, I’d definitely purchase this again! 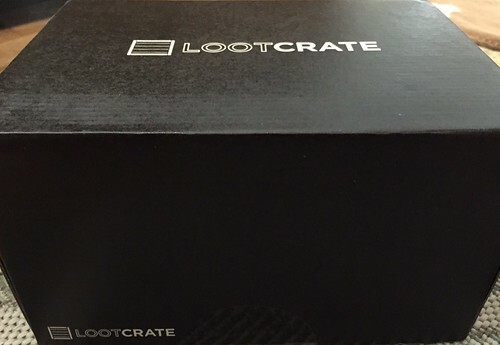 LootCrate is $13.95 plus $6 shipping and handling for month-to-month subscription. Less for multiple month purchases. They also now offer “Level Up,” 3 apparel upgrades at different pricing levels that you can add to your monthly subscription. This month’s theme was Out of Time! EXCLUSIVE Dr Emmett Brown Funko POP! 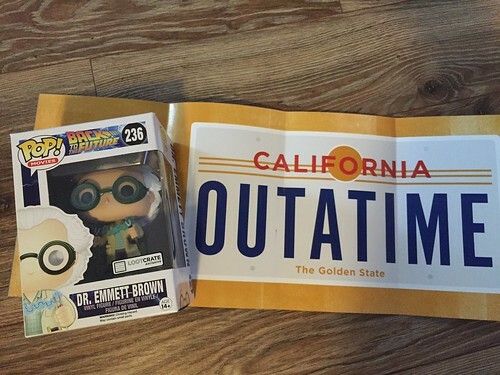 (selling for $28.00+ on Amazon) – I didn’t have a Doc Brown POP yet, tho I do have the Marty in a Delorian. So, I was super excited to see this guy. The standard, non-Loot Crate version with a remote control is $17.95 on Amazon. This version has his goggles on and holding jumper cables. 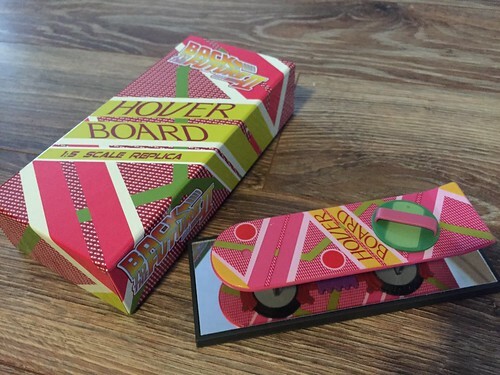 Hover Board Replica (Retail $25+ on Amazon) – This is really cute, tho I’m not sure where to display it. But I won’t say “no” to any Back to the Future item. 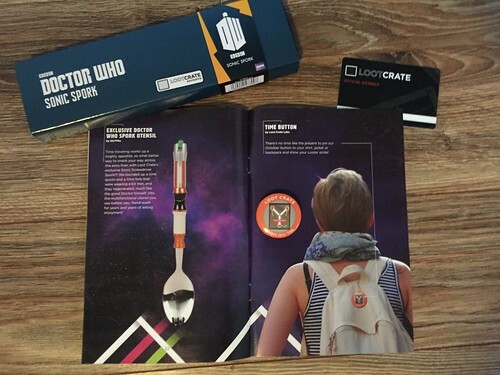 Dr Who Sonic Spork (Retail $14.98 on Amazon) – I don’t care for Dr Who, so this will be the one thing I won’t be keeping. And each LootCrate comes with an exclusive pin. This one is the Flux Capacitor! 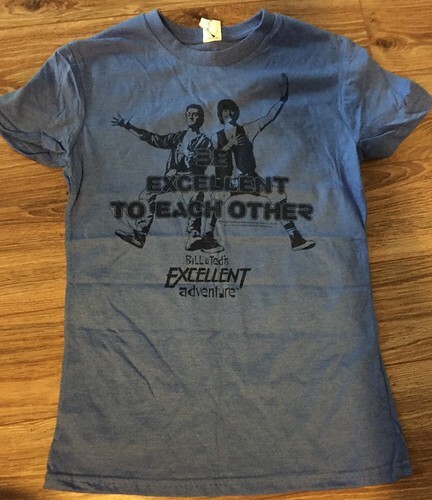 Be Excellent To Each Other Tshirt (Retail $10?) – I LOVE this shirt! Unfortunately, their “Womens” sizes are actually Juniors. Fair warning – get a size or 2 larger. Thankfully, it’s a thinner shirt that I can probably stretch out. 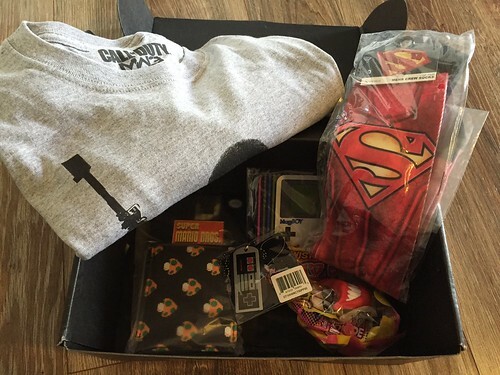 Another great thing about Loot Crate – you even want to keep the box! Summary: This month more than made up for the miss with August’s box. I’m keeping everything but one item, which is great. If next month is just as good, I may have to keep up my subscription. 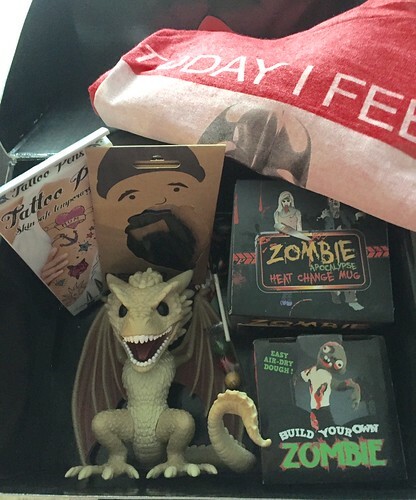 What do you think of this month’s Loot Crate? You may want to hurry though, as the first box closes on October 29th. Press Release info: Outer Places, the digital media company that explores the intersection of science and science fiction, is launching its Supply Pod mystery box program. Supply Pod uniquely delivers products themed around upcoming sci-fi releases and scientific events. The first box is based on the real-life science behind Andy Weir’s debut novel, The Martian, which inspired the movie starring Matt Damon about an astronaut stranded on Mars. The Essential Pod ($29.99 plus shipping, handling and tax) contains science and sci-fi items that would be great to have if stranded on Mars. The Deluxe Pod ($39.99 plus shipping, handling and tax) contains all the items in the Essential Pod plus a paperback version of The Martian by Andy Weir, currently No. 1 on the New York Times Best Sellers list. In addition, 50 Deluxe Pod customers could receive an autographed copy of The Martian. 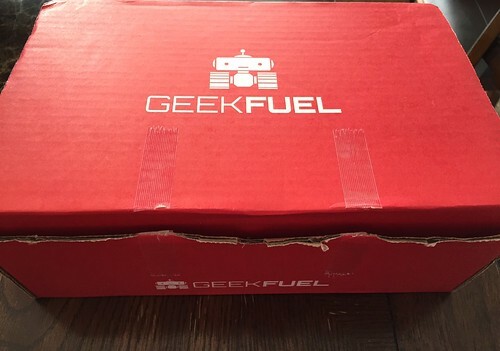 Geek Fuel is a monthly subscription box “filled with t-shirts, toys, digital games, limited edition collectibles, and all things epic.” The box can be purchased on a monthly renewal at $23.90 per month, or discounts for purchasing several months or more upfront. The box comes with a great mini magazine that’s always fun to flip through. Here’s a look at the contents of this month’s box. 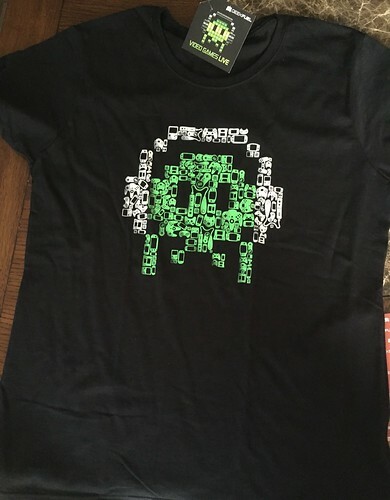 Exclusive Video Games Live T-shirt (Retail $10?) – As I’ve said before, I’m not a fan of games – so this (while a cute design) is a bust for me. It’s a Nap! 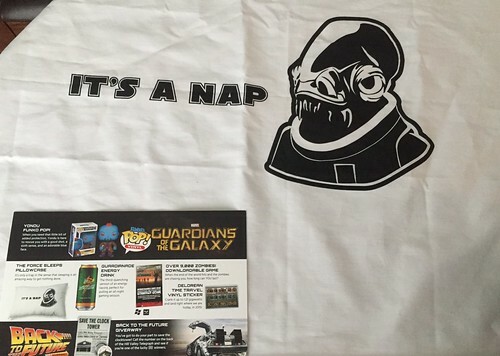 Pillowcase (Retail $15 on Etsy) – This is a really fun item for any Star Wars fan. It’d make a great gift too. 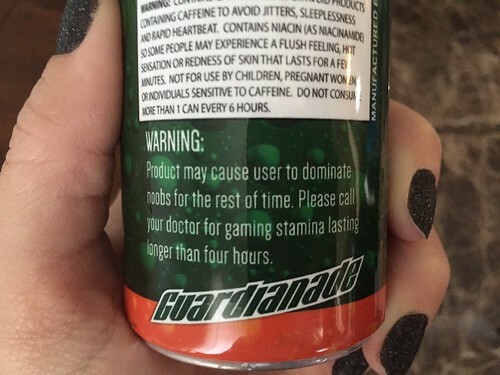 Guardianade Energy Drink (Retail $?) – As I don’t know games, the theme is lost on me. But it’s a fun design, and something I’ll probably use some weekend – maybe while watching a marathon of movies. See the image below for the clever disclaimer on the can. Over 9,000 Zombies Downloadable Game (Retail $10) – A waste for me, but I’ll ask around to see if any of my friends like arcade games. Delorean Time Travel Sticker (Retail $1-2?) – Everyone is jumping on the Back to the Future anniversary – and I couldn’t be happier. I’m definitely going to find a place for this. 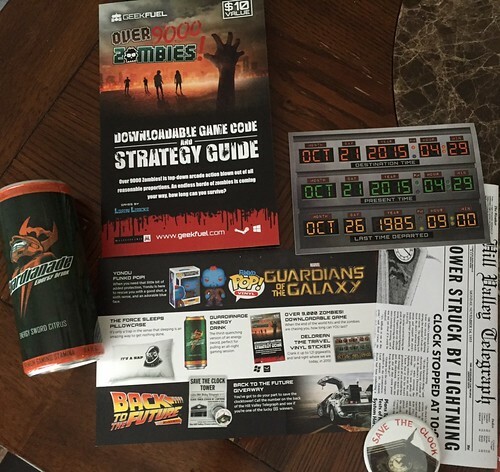 The box also came with a movie replica Save the Clock Tower flyer that has a phone number on the back to see if you’re one of 88 winners. I wasn’t. But it was certainly a fun idea. And it also comes with a Save the Clock Tower Button – just to get you in the mood. 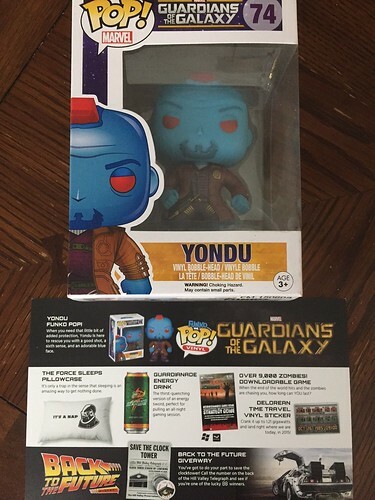 Yondu Funko POP (Retail $7.50) – Guardians of the Galaxy is my favorite Marvel movie, and I don’t have this one yet! This was my favorite item by far. Too bad it couldn’t be an exclusive, but I’m happy anyway. 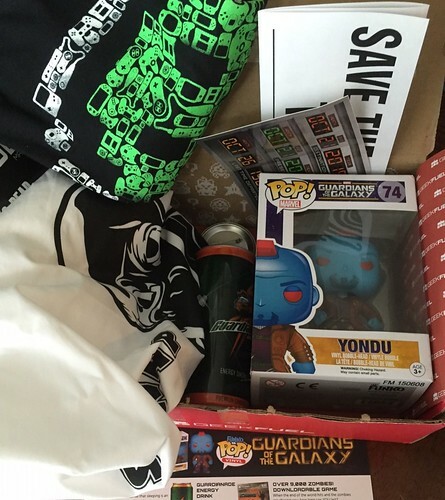 Summary: Guardians POP, Back to the Future, and Star Wars items all in one box – this makes up for the lack of keep-able items in the last two boxes. I may take a break for a while from this box, but this made my day. September’s box that was sent to me for review purposes was the Deluxe box. 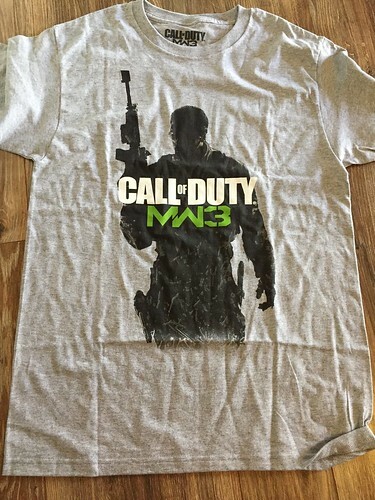 Call of Duty T-shirt (Retail $10?) – I’m not a gamer, so this shirt is a miss for me, but I do like the design. Super Mario Bros. Wallet (Retail $18.38 on Amazon) – This is a cute bifold wallet that my nephew will love. 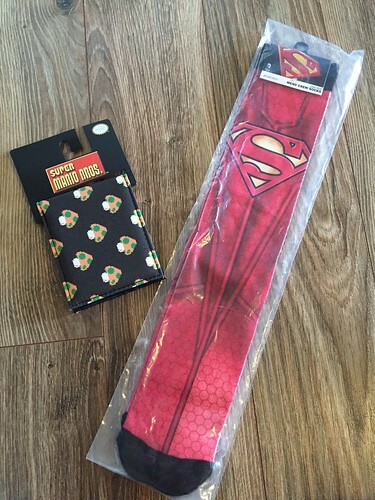 Superman Crew Socks (Retail $8.65 on Amazon) – These are large, crew socks and seemingly well-made. These don’t seem to fit the gaming/pixel theme, but are probably my favorite thing in the box this month. MugBoy GameBoy Coaster (Retail $?) – I couldn’t find this listed on Amazon. But it’s a large, rubber coaster. At first, I thought it was a large magnet by the weight and feel. It’s a clever, cute design, looking like a retro GameBoy. However, I’d recommend only wide cups or mugs used on this, as there is a bit of texture to it. 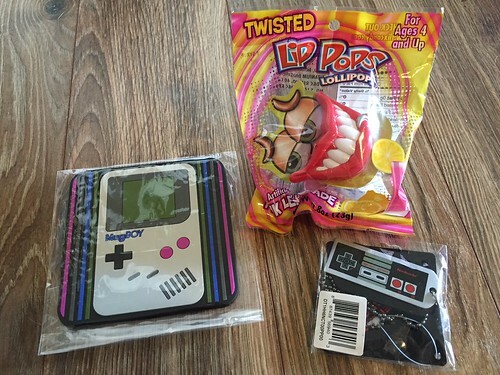 Twisted Lip Pops (Retail $5?) – This is filler, but my niece is a candy fiend and will love it. Nintendo Keychain (Retail $8.53) – Again, fans of classic gaming will may enjoy this large, rubber Nintendo key chain, made to look like an old controller. See, even though I never played as a teen, I recognize this stuff! Summary: While the theme was a bust for me, as I’m not (nor ever have been) into gaming, the value is definitely here for the right audience. I look forward to seeing what this new branding may bring. I’m hoping for a more definitive theme, and one that’s announced on the updated website each month. 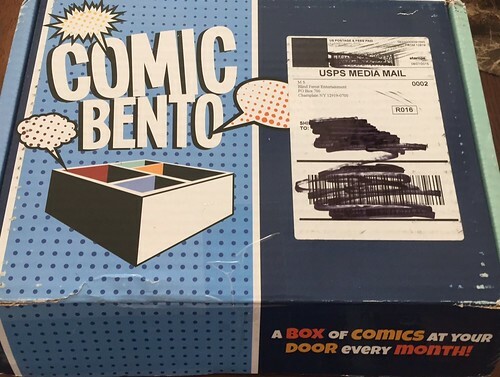 Comic Bento is a subscription Graphic Novel Box – A surprise selection of fantastic Graphic Novels with at least $60 worth of comics in every box and mailed right to your door! Pricing starts at $20/month plus shipping. 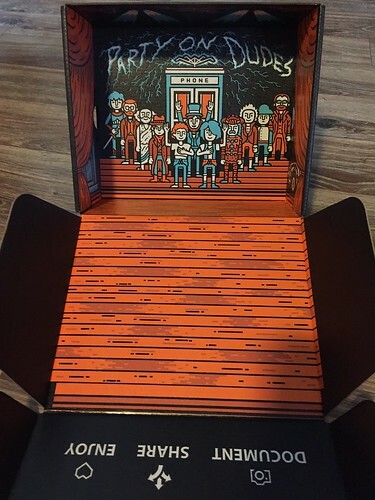 The box comes with a nice card that gives details on each of the selections. 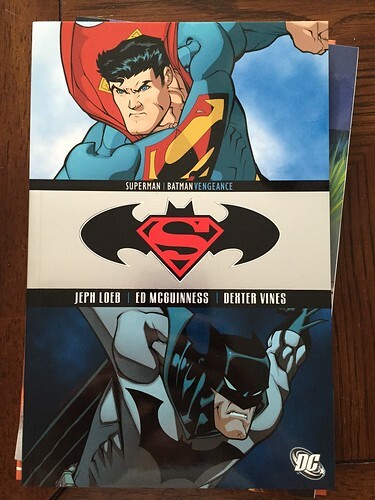 Superman Batman: Vengeance (Retail $12.99) – I already had the first and second volume of this series, so this was a win for me! I loved this series when it started. I just got distracted and forgot about it after a while. I’m happy to get back into it though. 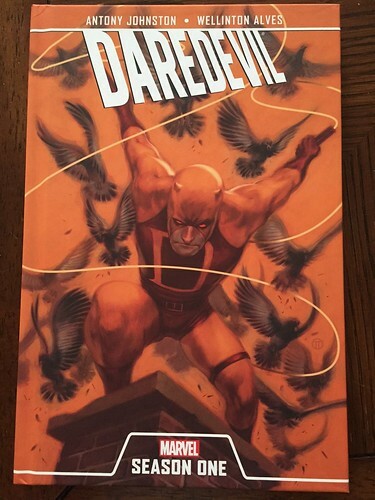 Daredevil Season One (Retail $24.99) – I just started collecting these Season One editions, so I was happy to see this. It’s also a hardback, which adds more value to the box. I don’t think I have any standalone Daredevil books. 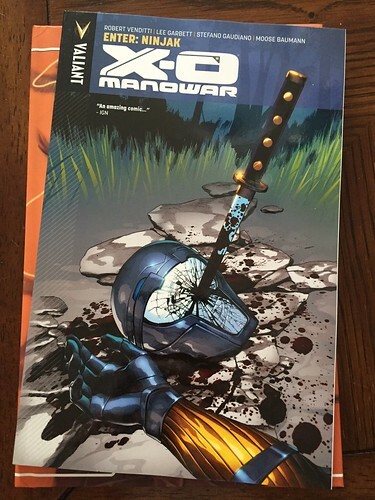 X-O Manowar Enter: Ninjak (Retail $14.99) – Here’s a series that’s new-to-me. It has good reviews on Amazon, so I’m excited to try it. 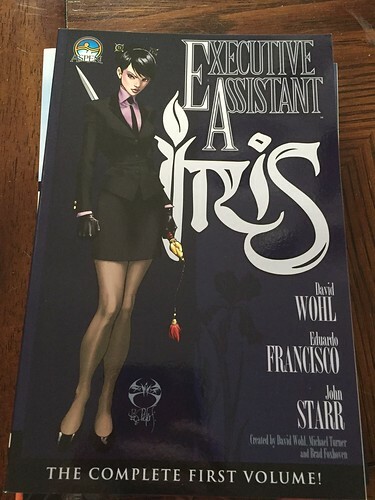 Executive Assistant Iris Volume 1 (Retail $18.99) – This is another new one for me, not being mainstream DC or Marvel. But a strong, female lead – I’m willing to give it a go. 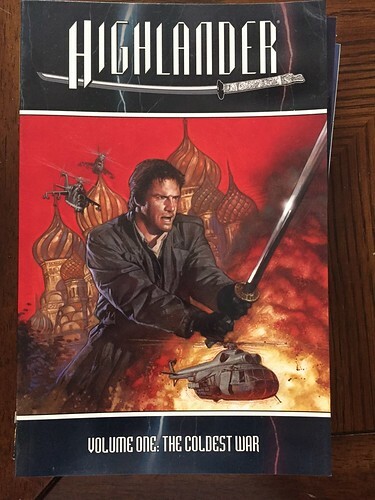 Highlander Volume 1: The Coldest War (Retail $19.99) – This was a bonus item that I would otherwise love, but I already own volumes 1 and 2. But hey, it was a bonus item. Summary: This is probably my favorite subscription box. I could only love it more if it was weekly instead of monthly. I love that it introduces me to new series and offers older books. I already buy newer graphic novels, so there’d be more likely of an overlap that way. And the value in the box always greatly exceeds the price. So, I highly recommend this sub to comic lovers and new comic readers.